When it comes to operationalizing your privacy compliance, the need to create efficient ways to deliver data subject rights, specifically those related to subject access requests (including change or deletion), is essential to not only your legal obligations, but also to maintain high quality customer relationships. Honoring these requests is challenging enough operationally, and additional hurdles arise when attempting to comply with multiple laws in overlapping jurisdictions. Being able to deliver in an efficient and effective way is critical to achieving success with your business goals. 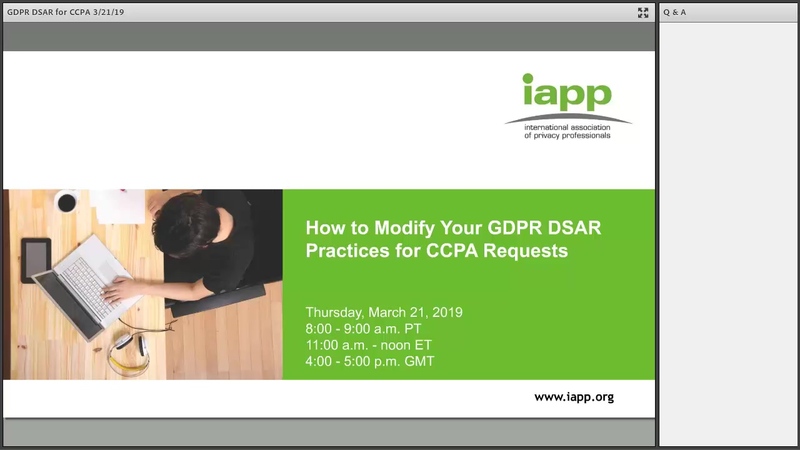 In this this educational web conference you will hear seasoned privacy professionals discuss tactical and practical ways you can refine your GDPR processes to also comply with subject access requests under the CCPA. You’ll also hear about how you can scale your processes to meet increasing subject access request demand volumes. These answers are provided for informational purposes only. They do not constitute legal advice or reflect any opinions on any particular law or regulation. The information contained herein is subject to change and may become inaccurate or outdated over time. You should seek guidance from independent legal counsel on these items. Does CCPA govern non-profit organizations? How do we know that the AG will not enforce regs until July 1, 2020? By placing all your data in a data lake, don't you increase the risk of damage from data breach? With a data lake, how do you handle still deleting/anonymizing data in your backends? If a data lake contains copies of data, but all data actually "lives" in backend systems, how would you accomplish both? If you have petabytes of personal information, how do you cost-justify having a copy of everything? Could we link the Do Not Sell button to the same opt-in/opt-out capture page we use for GDPR cookies? We break our cookie acceptance down by categories, including marketing and analytics.. It seems like there is overlap there and it might make sense to utilize the same tracking system. Does Do Not Sell need to go on mobile sites/apps as well? If a business does not sell information, is the "do not sell my personal information" link still required? The Online Behavioural Advertising example of Selling is quite confusing. Are you suggesting that if a customer clicks the "do not sell my data" button they are in effect opt-ing out of all OBA activity? Given the broad definitions of personal information (which includes unique identifier such as IP address, cookie ID, device ID, customer ID) and of sale (includes disclosing or permitting access to personal information by a third party in exchange for monetary or other valuable consideration) third party advertising and analytics activities should be reviewed for CCPA compliance purposes. Where will companies provide employee privacy policies and "Do Not Sell My Data? You mentioned that being GDPR compliant may not be enough for CCPA. Can you go a little more in depth regarding the areas that a business would need to look into more in order to be compliant under CCPA? Do you have suggestions for responding with "no" because data is covered by an exception? Does the HIPAA exemption apply only to PHI/ECHRs or all personal information collected on the data subject? What kind of health care related data would not be covered by the HIPAA exclusion? Do you know of/have any resources for creating a SAR procedure? Any recommendations for verifying a consumer request if the consumer does not, or will not, provide an email? Can you define California resident? Can you discuss how CCPA requires categorization when responding to SARs? For example, the category of PI or the business use. How will this information be conveyed back to individuals? Can you explain why employee data is covered? Could the photo validation be considered biometric information? Do explicit matches only satisfy GDPR and CCPA access right requirements? Does a CA resident sitting outside of CA still have rights under CCPA? How do we verify a request is coming from a CA resident? Does CCPA apply to non-CA residents while visiting CA? In other words, the speaker mentioned possibly using IP address to determine what web behaviors should appear. I don't think this makes sense, and only an affirmative statement from the data subject should be used to confirm residency. Can you confirm this? The CCPA applies to California residents, not visitors of California. However, accurately determining residency is not always possible, in particular at the point of collection. For this reason, many companies are choosing to manage their data for CCPA compliance-in other words to assume all data collected/processed is subject to CCPA (e.g., for purposes of data mapping and enabling the technical controls needed to comply with access, deletion and do-not-sell requests). Does the CCPA apply to employees or just consumers? In providing the disclosure as to the categories of PI collected, how broadly or narrowly should the categories be? For instance, is "Employment Data" an acceptable category or does it need to be more specific? In responding to an access request, CCPA requires a business to provide PI according to the enumerated categories of PI. How should a business respond to consumers if they are subject to multiple privacy laws with different categories of PI? Is a CA Resident someone who has resided in CA for x years; is there some type of law that indicates they have to have lived in the state, x years to be a resident? If someone lives in Ohio but is in the service in CA does that mean they are a resident in CA? Is there any guidance on minors aged 16 -17 as far as opt-in or opt-out applies? Is there any obligation on the user to block cookies? Under CCPA, is anonymization a viable strategy to meet 'erasure' requests like it is under GDPR? Under Individual rights to deletion, what are the available exceptions or conditions where request to delete may not be actioned? What are Kate's views on the requirement to provide the 12 month look-back for the period before the CCPA is enforceable? What specific categories in a response would suffice? Where CCPA primarily focuses on Consumer, how is a merchant that utilizes personal information for their business scoped? Does "selling" include sharing personal data with your affiliate organizations? Does CCPA say that suppliers that an entity uses have their own (contractual) obligations but also that that SAR is their responsibility as well? In other words if an entity receives the SAR and they have share the data just to provide the service, then they would forward the SAR to the supplier who independently has their own obligation or does the entity who received the request have to manage compliance? During the Q&A, could you expand on the discussion related to digital advertising and how companies need to look closely at this in relation to it being a "sale?" Given a company that has multiple legal entities (through past acquisitions), if a data subject provides their data to legal entity A, and that entity determines that legal entity B should respond back to the customer and transfers the contact record to legal entity B, is this transfer considered a "sale?" How do we categorize and manage Service Providers differently from "Third Parties", for contracts and understanding CCPA obligations? How do we separate exchanging for benefit and engaging service providers where data is exchanged? If a partner receives a deletion request and sends it to my company, is the requirement to delete all of the data from that user that I received from the partner or all data that we have from that user? If you have entered into a controller-processor DPA with a vendor is it reasonable to assume that transfer of data to that vendor will not be considered a "sale" under the CCPA? On to whom/from whom - is it just categories of third parties or do we need to name the third parties? What if we don't sell information? You talk about 3rd parties should be participating in the DSAR process but you talk about it as if it's a nice to have but it doesn’t sound like it’s mandatory. Can you speak more about if 3rd parties are a hard requirement or more of a nice to have?